Open Cretan stitch is a hand embroidery stitch that is useful for working borders and lines and is often used in crazy quilt stitching. It is similar to feather stitch, but with a more geometric look to it. Like so many other embroidery stitches, there are a variety of ways to adapt this stitch to alter the look. This stitch is worked from left to right; if you are left-handed, flip these instructions and work right to left. It is helpful to work on even weave fabric or to pre-mark your fabric with horizontal lines, using ​a water-soluble marking pen. Regardless of the variation, you are stitching, there will be an upper and lower line, with two lines in the center. The spacing of these center lines is one factor in altering this stitch. Bring the needle up on the lower line of the two center lines (point 1). A short distance to the right of where the needle came up, go down on the uppermost line (point 2). Come back up directly below this on the upper line of the two center lines (point 3), catching the working thread from the first part of the stitch. 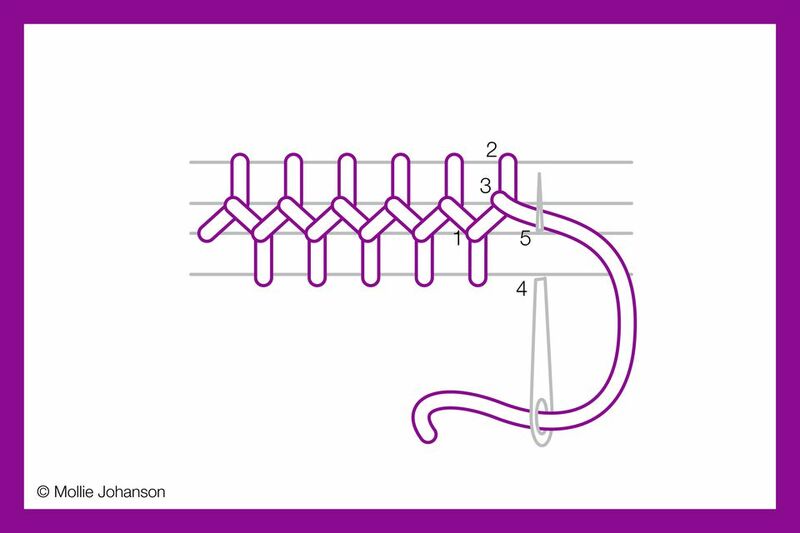 This stitch may be taken in one motion with the sewing method, or as two separate steps if you wish. Go down through the fabric just to the right of where the needle came up and on the lowermost line (point 4). Come back up directly above this on the lower line of the two center lines (point 5), with the working thread under your needle (or to the right of the needle if you use the stabbing method). As you repeat this process working along a line, point 5 is now point 1, and you are ready to continue now going down at point 2. The zigzag of open Cretan stitch makes an excellent border stitch as-is, but especially when combined with other stitches. The open sections of this stitch are a perfect place to nestle in some detached stitches. Layering this stitch with itself also makes for a textured line of stitching with great dimension. Work the stitch in one or more colors or weights of embroidery threads. Use the same marked guidelines, placing the second line of stitching in the gaps from the first line. As the name suggests, open Cretan stitch is a variation on Cretan stitch or closed Cretan stitch. Open refers to the horizontal spacing of the stitches, and by adjusting that spacing the look of your stitching will change quite a bit. Another way to alter this stitch is to move the center two guidelines. They don't have to be centered between the upper and lower lines. In the lighter blue sample above, those guides are lower, thus creating a less-symmetrical line of stitching. Similarly, you might try opening the space between those center lines, placing each of them closer to the upper and lower lines. Try working open ​Cretan stitch several ways so you have options for stitching and frames!